Bartica was yesterday officially declared a capital town and President David Granger promised that all government buildings in the municipality will be powered by renewable energy by the end of his current term in office. “You are a town now. 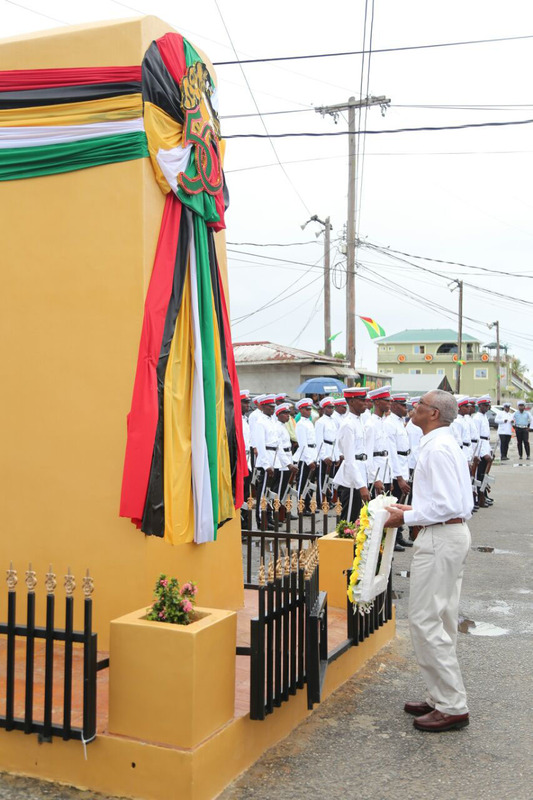 This is your moment to dazzle the rest of Guyana,” Granger said to the applause of residents and his accompanying entourage, which included several ministers of government and other dignitaries, at the ceremony yesterday. Bartica, in Region Seven, which was first gazetted as a town on October 21 last year, is set to be the model town for the green economy that is being pursued by central government. Against this background, Granger highlighted his participation in the recently concluded US-Caribbean-Central American Energy Summit, in Washington, DC and said that it has hastened the plans for greening Guyana’s economy. “In Washington, DC, was one of the most important conferences I ever attended in my life. This has enforced more in my mind the conviction that Guyana has to move more quickly to develop a green economy and Bartica is to lead the way. Bartica is to become the first green town,” he said. “Bartica is going to lead the way in solar energy. It is going to lead the way in electrical vehicles. It is going to lead the way in wind energy, in solid waste management, in recycling. Bartica is going to become a laboratory for Guyana’s green economy,” he added. With a growing market for renewables, the Caribbean and Central America are being urged to diversify their fuel sources and the US last week also unveiled US$10m in grant financing for clean energy projects. However Guyana was not listed as among the countries that could potentially benefit. 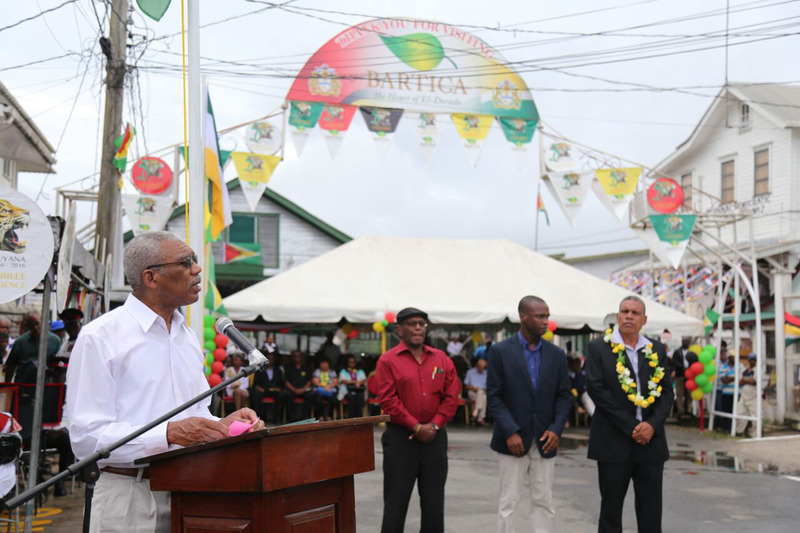 Granger did not state how his government intends to gain funding for the project but laid out his vision for the town and pointed to four pillars that will transform Bartica. “I would like to see students from other countries coming to Bartica to learn how to be Green. Every school, every hospital every government building has to move quickly over the next four years to adopting sustainable sources of energy. No more addiction to gasoline and dieseline, we moving to clean energy. So, Bartica must lead the way. It must be a model town for our green economy, showing all other towns and regions of Guyana that they can supply enough energy without depending on fossil fuels. 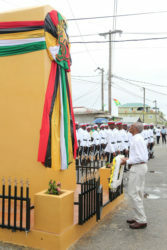 Bartica must become the motor to transform Guyana on to the platform of a sustainable green development,” he stressed. During his address, the President said Bartica, apart from being a model, must become a magnet for economic growth and investment. While the new town’s Mayor, Gifford Marshall, did not speak at the ceremony, he has been touting a similar vision for his town. Marshall believes that Bartica can not only be the green capital of the country but also Guyana’s first tourism capital. “We intend to build a modern town hall with our hope that the building will be a centre-piece for 100 years from now and will represent our culture and who we are as a people,” he had told the local media corps at one of his first press conferences. “It will have solar panels and we intend to explore underground parking because when you are passing we don’t want you to see the vehicles, we want you to see a beautiful park with trees,” he had added, saying too that while the project is extremely expensive, with the help of stakeholders and government it can be achieved. “We have to restructure our roads if you are going to become a green town. You must consider the asphalt and explore other building material and restructure it in such a way that we have proper lanes and the lights work,” he said. Another major project he highlighted was the building of a municipal airport, which he hopes will be able to link Linden, Mahdia and Lethem. President Granger yesterday said that with a modern airport, investors will feel more comfortable coming to a developed community and will fly in, “bringing bags of money” to invest into the region.